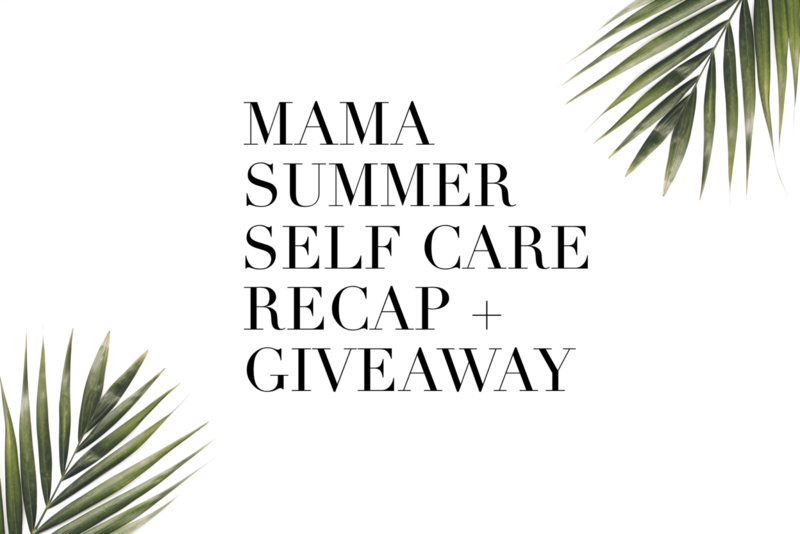 Summer Recap- Mama Self Care + Giveaway – The Joyful Life Co. This summer, amongst all the family fun with the summer bucket lists we really tried to focus on mama self-care, for us and to share with all of you! Self-care is honestly one of those words, that when I hear it, it annoys me. I get this feeling like “I know…I know…. you all talk about it, and I know I should be doing it, but I just don’t have time! Be quiet all you perfect people who can self-care all the damn time”. And those feelings are exactly why we talked about it all summer! Self-care can feel like just another thing to do- I totally get it- but it really falling down and burning out, I have learned that it just can’t wait until (the kids are older, things slow down, the house is organized, hockey is over, the new year etc.….). Part of my shift in self-care has come from a place of wanting to show myself self-love. My big motto I live by is: BIG LOVE. My question to myself this summer was how can I show myself some of that big self-love? This made the self-care thing a bit more manageable- it also helped take care of some of that BRUTAL mom guilt any time I do take time for myself. It also made the small acts, like a healthy meal, a 5-min. walk or a quiet moment feel like they mattered. They do matter, because I matter (whoa that’s even hard to write!). We talked about the very important, and oh so hard task of saying ‘NO’. Making time for what you and your family need and not exhausting yourself! This one’s a good one, with a whole chart on ways to say NO. We chatted gratitude, paying attention to the little things and how the shifts can make us so much happier. Recharge in 20 min. was our message about not waiting for the whole self-care day 3 months from now, weave it in to your routines. Health and fitness, we talked wellness and getting our bodies moving, even when they tell us not to J. We capped off last week talking about letting go of the perfection of balance and aiming for bits of all the important things rather than equal parts. And today, we are talking self-love, as a way to think about self-care! Whoa, lots of info, but have a scroll back and read the posts, they are short and packed with info, our own stories and tips! So as the first day of fall is upon us, and the end of our Mama Self Care challenge is near, we want to celebrate YOU and all the beautiful work you have done with a giveaway! We have a beautiful Ink Pad YWG Mama Tank (http://www.theinkpadshop.ca/) and beautiful products by Dadirri naturals (http://dadirrinaturals.weebly.com/), including the amazing Natur’el Tea that Dadirri carries! So, mamas, all ya have to do is snap a pic of some self-care, something ya do for you. Share it on Facebook/Instagram. Tag us and use the #bucketofjoy – just like ya did for the mini session contest! We can’t wait to see all of yourself care in photos- JOY CREW- you are amazing! Thank you for being with us this summer as we chatted self-care!